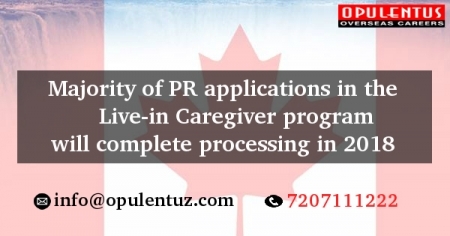 IRCC has said that the backlog of most of the PR applications found in the Live-in Caregiver program will complete their process stage by December 2018. There was also an announcement that it has a plan to process 80% of the PR applications which were submitted on or before October 1st, 2017. This provision applies to all LCP applications that were provided by family members or caregivers. Immigration Minister of Canada, Ahmed Hussein, announced that the government is deeply committed to clear the pending applications to get the PR status under the LCP. Applicants who had faced separation from their family members and had suffered delays owing to bureaucratic hurdles would soon get their PR applications processed. They can now unite with their beloved family members in Canada, he added. LCP offers foreign nationals minimum two years full-time job as live-in caregivers. This is a direct pathway to attain Canada PR status. As per IRCC, 6000 applications can be submitted, under LCP, to gain Permanent Residence in Canada. It is committed to processing 80% of the new forms under LCP before the end of 12 months. This provision applies to all the applications which were submitted by October 1st, 2017. IRCC mentioned the figures of October 2017, when the applications under LCP, waiting to be finalized, for PR had decreased by 63%. Additional resources were dedicated, and IRCC processed the pending applications. This led to the decrease the backlog of applications. This has also enabled IRCC to finalize 5,000 additional applications compared to the earlier estimate for 2017. 20,000 new PR holders will be invited to Canada in 2018 through this Live-in Caregiver program.